As a preface, I'd like to explain why I don't have a title that somewhat explains my project. I made small string balls. I couldn't think of anything with the word 'balls' that didn't make me giggle. I think I might just be immature. Now that hopefully I made you giggle thinking about 'balls', I'd like to give you a little backstory. While GB and I visited our amazing friends in North Carolina we spent an afternoon antiquing. It has quickly become one of our favorite things to do. While searching through an antique store we came across a beautiful boat. The woman who ran the shop told us it was hand carved. Even better. We thought it would look great on our coffee table. I knew I'd have to fill it with something, and then I remembered the string balls. I made a larger version than what I made this time, for my sister when she graduated grad school. This second time around was just as messy. 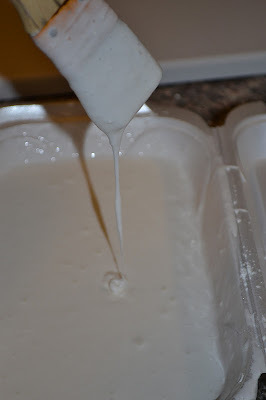 All you need is glue, some cornstarch, water, ballons, and string. I tied a string between two chairs in my kitchen and put down an old sheet to catch the drippy mess. Next I almost passed out blowing up the world's worst balloons. I think they have been sitting too long, or just a crummy brand, but these were the hardest balloons to blow up. Next I mixed flour, cornstarch and a little bit of water, until it was a thick, yet runny consistency. Next I dippped string (I just used cheap yarn) in the mixture. 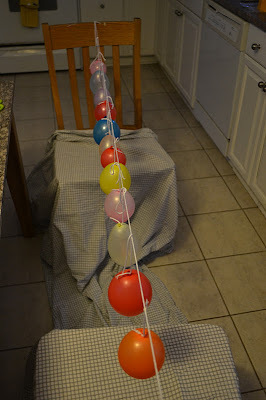 When it was completely soaked in the glue, I began wrapping it around the balloons. In the morning the string balls had hardened. I think I used too much glue, because when I popped the ballons, the balloons were still stuck all around the ball. I just pushed and pulled the balloon away and eventually the balls were free. The most annoying part was the dried glue in between the string. I had to scrape it all away. Next time I do this, I'll definitely make sure there is less glue on the balloons. These crappy balloons stained the balls!!! So I spray painted them white. Normally, I would just use clear coat spray paint, but these balls needed the paint. I also could have spray painted them any other color I wanted. Maybe pink or blue for a baby shower? Or wedding party colors for a bridal shower? After they had dried, I popped them in the boat. I love it! I love how the white pops out. Let me know what you think of this little project. I'd love to hear from you!